Fall has arrived and I bet it has you day-dreaming about a warm-weathered vacation destination? I am sure some wonderful getaway comes to mind. You must think about what you will be wearing and what luggage you would need. Well, there is a clothing brand that could help you. 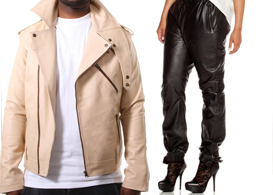 It is called PRSVR- an elevated lifestyle Chicago-based brand, founded by designer and CEO Brandon Williamson. PPLA was lucky enough to sit down exclusively with Brandon and talk fashion. Peseverer is the French translation for preserve or PRSVR. The name PRSVR stands for Passion, Resilience, Sacrifice, Values, and Respect. The sole message of the brand is to strive to better ones self and inspire others. The brand was officially launched this September. The initial collection is leather based luggage and outerwear. Each piece has a very unique style and functionality to it. I enjoyed browsing through the new line called “Destination 2012.” Everything is made from nappa leather, premium materials, and handcrafted designs. The brand also uses slaughter-free leather. The line includes many unisex pieces for men and women. If you appreciate luxury and are looking for a comfortable and versatile line to travel with, you must check out PRSVR. We spoke with CEO Brandon Williamson who has us excited about the line coming to Los Angeles soon! PPLA: When was the brand launched? How did you get started? BRANDON: We launched officially in 2012, 4 days ago! It is brand new. We started the idea about seven years ago, initially thinking we wanted to make a shoe. We ended up changing our vision to the current line of luggage and outerwear. I do still have a love of sneakers and we own an App called Sole Search, where you can search any place in the world for the specific shoe you are looking to buy. PPLA: What does PRSVR mean to you? BRANDON: The name is persevered in French. We wanted to choose bold language with meaning. Everyone asks what the letters stand for- we created this acronym: Passion, Resilience, Sacrifice, Values, and Respect. It goes into our everyday life. PPLA: Can you talk a little bit about the brand direction and whom you are aiming to target? BRANDON: The brand is now mixed luggage and outerwear and targets the 25-35 demographic. It is an elevated lifestyle brand that focuses on the idea that everyone’s lives are constantly evolving. Individuals are always in one stage in life and looking to get to another. We are catering to the idea of improving one self, pushing forward, and being better than you were yesterday. PPLA: What locations are most important to you when launching this brand? BRANDON: Our clothes are currently available online and in a retail store in Florida. We plan to expand the company to Los Angeles. L.A. has lots of exploding talent, so being here is very important to us. Of course, everyone looks to New York for fashion and follows their trends. There are a lot of brands that buy into the idea of following what high fashion does. We are trying to find a balance and hone in on the right people as customers. Creating the product is the easy part. PPLA: What season is most important for your line? What is your favorite item in your line? BRANDON: Mainly the line is for Fall and Winter with some Spring stuff. There is more luggage accessory-wise during those times. I’m from the Mid-west, so I’m really into jackets! We have some great things to offer, so be sure to check us out before your next trip!